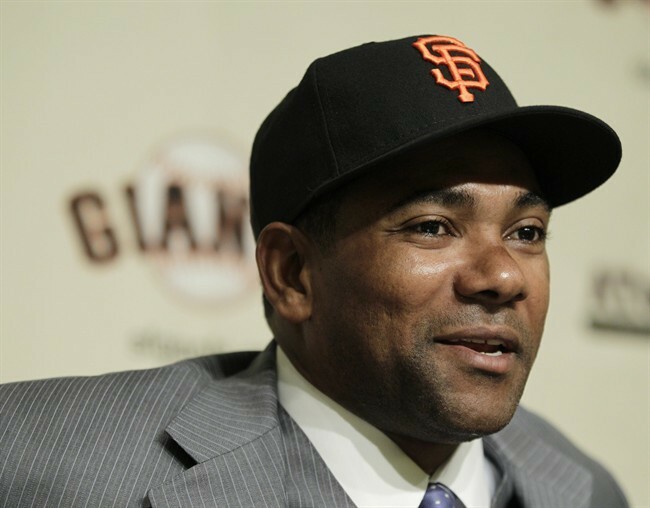 I was thinking to myself the other week, “Whatever happened to Miguel Tejada?” And then BAM, the Giants have a new shortstop. Don’t get me wrong, Tejada can be a great player, but I have to wonder if his best days are behind him. He made virtually no news in Houston or Baltimore so I sort of assumed he sucked and vanished. He is never on my fantasy baseball teams, which is the barometer by which all players should be judged, so basically I just didn’t care about him. When I first heard the news the he was now on the beloved Giants, I was pissed. I wanted some spry, young whippersnapper to take over shortstop, not some old washed up fart. But because I drank the Brian Sabian Kool-Aid many years ago, I thought I’d do my homework on this grandpa playing shortstop. What I found was actually exciting. Some of you may know the following, and if you do, stop reading now because I’m about to bore you. For the rest of you, it is quite all right to keep thinking I’m a genius. Miguel (we’re on a first name basis now) has averaged at least 158 games per season since 1999. Okay wait, he played 133 games in 2007 when he broke his wrist. We will forgive him because he was hit by a pitch. Gamer. He actually holds the fifth longest consecutive game streak at 1,151. Double gamer. He also has a decent defensive game. I’d count him an average shortstop with a nice arm. He can be prone to errors so I predict he will break all our hearts about 15 times this year. Hitting wise, he can still play also. In 2009, he led the majors with 46 doubles. Granted he was playing in a ballpark with a freaking hill in center field. Ridiculous. Most encouraging, last year when he was traded to the Padres he hit 10 home runs in 59 games at Petco. That’s impressive. He has a .287 lifetime batting average which is fine except that has started to slide in the last 2 years. Another potential for heartbreak is his ability to hit into the dreaded double play. He has led the majors 5 times in this category. Nary a good stat to lead the league. So let’s sum this up. If I were to tell you that our shortstop would bat about .275, get 80 to 90 RBIs, hit 15 to 20 HRs, score about 80 to 90 runs, and play every day, would you take it? I would. And that is about what he has been averaging in the last 5 years. Most importantly, who else is out there? Bobby Crosby, Orlando Cabrera, Cristian Guzman, Julio Lugo or Nick Punto? I’ll take our chances with Tejada. This entry was posted in Giants, Offeason Moves and tagged giants, sabean, stats, tejada. Bookmark the permalink. if the giants went in to 2011 with nick punto as the starting short stop i’d bury myself in the snow. also, if tejada bats in front of pablo at least the panda won’t lead the league in GIDP. also also, did have 199 hits in 2009. not bad. Of course that assumes Pablo actually starts this season. I’m terrified that he’ll continue to regress and play the season in AAA. nick w, welcome to the conversation! 2009 was a very good year for him. Hopefully he has some of that left. Oh I think he has it in him, I just don’t like what I saw last year as far as discipline, both at the plate and with his health.